ATLANTA – May 21, 2015 – Labor and employment law firm Constangy, Brooks, Smith & Prophete, LLP is pleased to announce that 28 of its attorneys have been recognized in the 2015 edition of Chambers USA: America’s Leading Lawyers for Business, a prestigious annual guide ranking the leading law firms in the U.S. Chambers USA ranks the top firms and lawyers across the country based on written submissions, thousands of in-depth attorney and client interviews, and its own database resources. The rankings reflect work performed, strategic growth, excellence in client service and contributions to the legal profession. 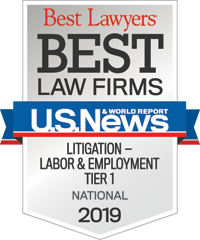 Constangy was ranked among the nation’s best labor and employment law practices in seven states, including Alabama, Florida, Georgia, Missouri, North Carolina, South Carolina and Tennessee. · Clifford H. Nelson, Jr.
· Kenneth P. Carlson Jr.
· W Randolph Loftis Jr.
· William A. (“Zan”) Blue Jr.
Constangy, Brooks, Smith & Prophete, LLP offers a wider lens on workplace law. We have counseled employers exclusively since 1946. With offices in 16 states, we are one of the largest labor and employment law practices in the U.S. Constangy holds a national Tier 1 ranking from the U.S. News & World Report/Best Lawyers Best Law Firms survey, and has been called a “go to” law firm by Corporate Counsel andFortune magazine. Many of our more than 160 attorneys have been recognized by leading authorities such as Chambers & Partners, Best Lawyers in America and Martindale Hubbell. Find out more about us online at www.constangy.com or follow us on Twitter @ConstangyLaw.